(Phys.org)—A team of researchers working at Rice University in the U.S. has demonstrated that graphene is better able to withstand the impact of a bullet than either steel or Kevlar. In their paper published in the journal Science, the team describes how they set up a miniature firing range in their laboratory and used it to test the strength of graphene sheets. Scientists know that graphene sheets are tough, due to their dense one atom think structure. Until now, however, no one has tested the material for use as armor—to protect against being struck by a speeding bullet. In this new effort, the researchers did just that, albeit at a much smaller scale. Scientists have yet to figure out a way to mass produce sheets of graphene in large sizes, thus, for this experiment, the researchers confined their efforts to a very small scale. Their firing range consisted of using a laser to vaporize gold filaments to serve as the gunpowder. The explosion pushed micron-sized glass bullets at graphene targets—10 to 100 sheets placed together to form a mat—at speeds up to 6,700 mph (approximately a third of the speed of a real bullet fired from an M16 machine gun). Electron microscopy was used to measure how well the graphene sheets absorbed the impact. The researchers found that the sheets were able to dissipate the energy of the bullet by stretching backwards—sort of like when someone jumps on a trampoline. Tiny cracks also formed radially, using up more of the energy. 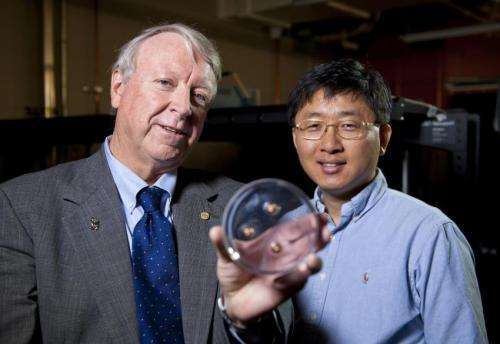 In analyzing the results, the researchers found that the graphene was able to perform twice as well as Kevlar, the material currently used in bullet-proof vests, and up to ten times as well as steel. Put another way, the graphene was able to absorb aproximately 0.92MJ/kg of projectile energy, while steel can typically absorb 0.08MJ/kg when both are being tested at similar speeds. 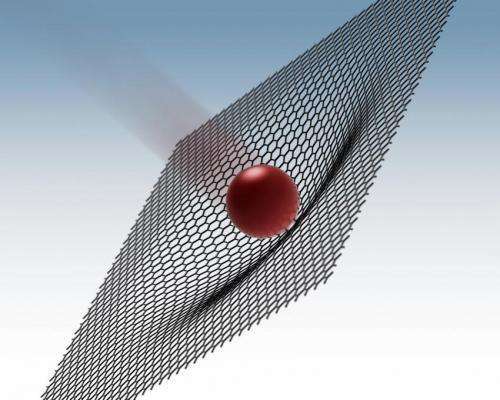 The ability of graphene to dissipate energy, the team explains, is due to a high degree of stiffness combined with low density, which means that energy can move through it very quickly, allowing for the dissipation of energy from something traveling as fast as a bullet. The researchers efforts show that graphene could very well mean a better bullet-proof vest, if a way could be found to produce it in enough quantity and at a low enough price. Multilayer graphene is an exceptional anisotropic material due to its layered structure composed of two-dimensional carbon lattices. Although the intrinsic mechanical properties of graphene have been investigated at quasi-static conditions, its behavior under extreme dynamic conditions has not yet been studied. 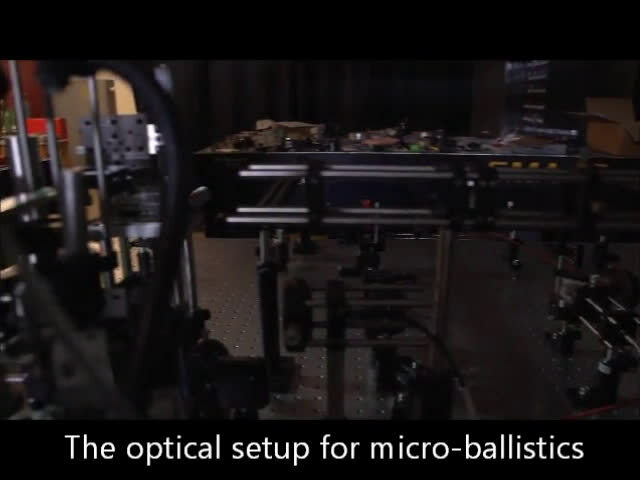 We report the high–strain-rate behavior of multilayer graphene over a range of thicknesses from 10 to 100 nanometers by using miniaturized ballistic tests. Tensile stretching of the membrane into a cone shape is followed by initiation of radial cracks that approximately follow crystallographic directions and extend outward well beyond the impact area. The specific penetration energy for multilayer graphene is ~10 times more than literature values for macroscopic steel sheets at 600 meters per second. "at speeds up to 6,700 mph (approximately a third of the speed of a real bullet). " Which gun are you using that is popping rounds out at 20,100 mph? I would like to shoot it sometime! The article badly misstates the speed of bullets. Quoting from the article, "The explosion pushed micron-sized glass bullets ...at speeds up to 6,700 mph (approximately a third of the speed of a real bullet)". But a casual internet search on "speed of a bullet in mph" or some such will bring one to sites where bullet speeds are said to range from about 600 to 5000 mph. A .38 caliber handgun round travels at about 1,000 mph. A 7.62 x 51 mm NATO (rifle) round does about 1,800 mph. A .50 BMG sniper round does about 2,000 mph. A .338 Lapua Magnum rifle round goes about 2,250 mph. A .223 WSM round, the fastest .22 caliber rifle cartridge, goes about 3,100 mph. I wonder if the author meant "a third of the ENERGY of a real bullet". 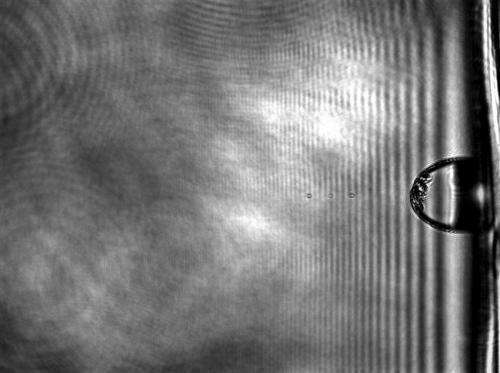 Glass beads impact with much less energy than, say, lead, even if traveling twice the speed of a bullet. No self respecting scientist is going to shoot anything in "MPH!" I'm going to guess 300 m/s which converts to 670 MPH. Article reads 600 m/s for bullet speed in their opinion, so 1340 MPH = bullet speed. Hmm, I will question it slightly until they can actually build a real prototype and test it with a bullet. My reasoning, when they did a similar test using a glass bead the size of a pin head - they said graphene was 20x stronger then kevlar and 100x stronger then steel. We just lost 90% of the strength. Or is that because the test sample in this study is impure and the graphene is not a precise matrix? Is this meant to prove the value of an early commercial graphene? 2x kevlar is still a nice jump, especially if it means we can improve the multiplier as we make a more pure form of graphene. Which is actually a good averaging of the bullet speeds, and got it wrong. It should be ~1342 MPH. Unless here's something in the full article (which I can't read), that's all I can think of. PS no one uses mph to talk about bullet speed.